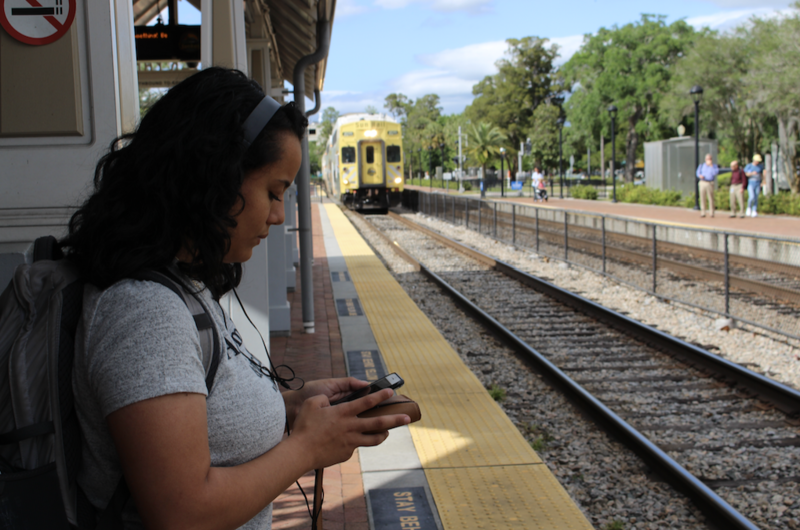 Felicia Morel (‘19) enjoys taking the SunRail to and from campus because of its affordability. In an effort to avoid the lack of parking spaces on campus and the never-ending traffic of I-4, some Rollins students, faculty, and staff ride the SunRail to and from campus. Due to the frustration of parking at Rollins, commuters have found that the SunRail helps to reduce stress and even offers a chance to network and meet new people. 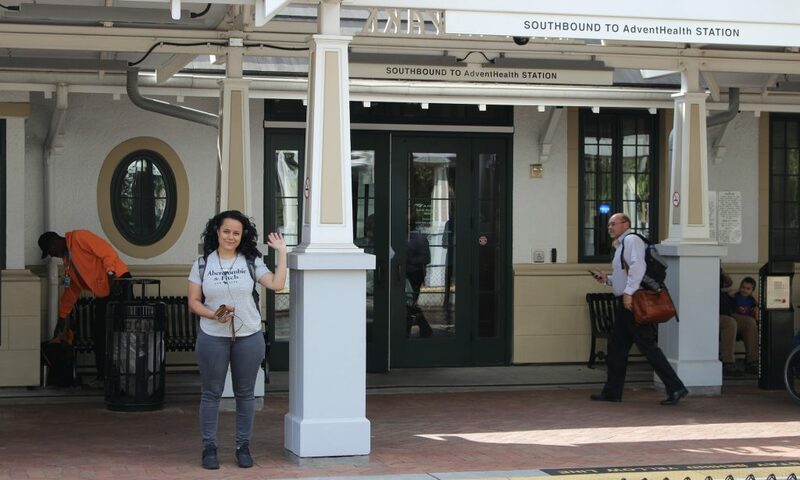 Alesha Martin (HH ‘19), a frequent rider, appreciates taking the SunRail instead of driving 45 minutes from her home in Deltona. “With all the traffic and construction that happens on I-4, taking the SunRail is a much more effective way to travel,” said Martin. For Felicia Morel (‘19), it is a matter of affordability. Morel lives in Kissimmee, and as a financially independent student, she said riding the SunRail is much cheaper than buying a car. “The train is really a life saver,” she said. The SunRail has provided a commuter rail service for both residents and travelers in the greater Central Florida area since 2014. The service covers 61.5 miles and it includes 16 train stations. In 2018, the SunRail had an average of 3,400 riders per weekday. One station is located in Rollins’ own backyard on 148 W Morse Blvd. The train releases passengers into Central Park alongside Park Avenue. The ride allows commuters to spend more time relaxing or working on assignments at the tables inside the train, rather than dealing with the stress-evoking problem of where one will find parking on campus. Dr. Jana Mathews, associate professor of English, also prefers taking the SunRail instead of driving. For her, driving on the expansion project of I-4 is nothing short of a near death experience. To the surprise of SunRail commuters, many connections and a sense of community has been made on the rails. Who needs to go to job fairs, when a SunRail ticket costs $2 for a one-way ride and who knows who you will meet on the way? Felicia Morel waits for her afternoon SunRail ride at the station off of Park Avenue. Mathews has found internships and jobs for students through professional connections and even made really great friends. “When I didn’t [ride] for a week because of Spring Break, my police officer buddy joked that he was about ready to issue a missing person’s report,” said Mathews. Karla Knight, academic administration coordinator, is glad to substitute the ride of the SunRail with a previous one to two hour drive to and from work. “I was wasting time, wasting gas, causing wear and tear on my car, and would arrive at work frustrated from traffic back-ups only to become more frustrated trying to find parking on campus,” said Knight. By taking the SunRail, Knight said she is saving money, getting more exercise, reducing stress, and meeting so many great people on the train. “For me, riding [the] SunRail is a no-brainer and a win-win option,” she said. Dr. Susan Walsh, associate professor of biology, echoed the positive outlook about taking the SunRail. “Even though I only live one stop away, having a relaxing walk on either end and a stress-free commute is absolutely worth it,” said Walsh. However, the main problem for commuters is the cost of the train ride. Although the Sunrail is cheaper than driving, commuters, such as Martin and Walsh, have raised the idea of student or employee discounts. “Given the parking situation on campus, it would be nice if there were employee discounts for those who use this transportation,” said Walsh. Therefore, there is an inquiry for the SunRail to be supported as a better alternative to the parking crisis on campus by offering student and employee discounts.